Merci beaucoup, Cécile! 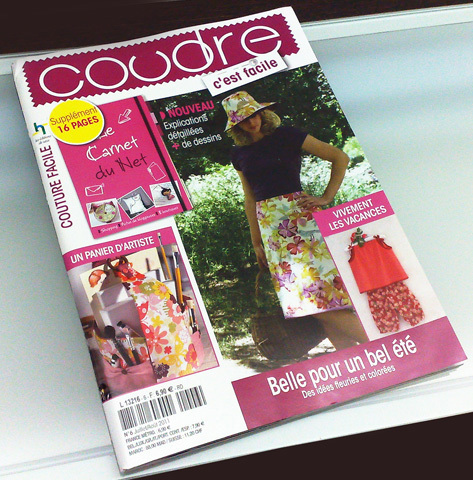 For selecting me to be featured in Coudre magazine, June 2011. 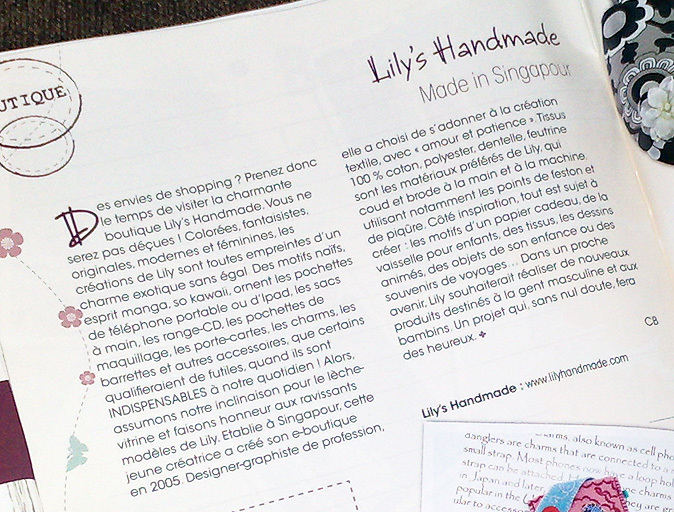 I am so delight and glad to see my handmade products being published in overseas magazine. To my surprised, I saw so many talented crafters/designers in Europe and with their beautiful products too. Although, I may not understand French but I have typed it out at the Google translater to translate the write-out in the magazine. I would like to apologize in-advance if you find the message may sound funny as you know, the internet translates exact word by word, therefore, the placing of sentences may not very right. But you still can get some right information from it. Of course, those who understand French will be better, as you will get the right juice out of it. Enjoy reading! .^_^. Cravings of shopping? Take time to visit let the charming boutique Lily’s Handmade. You will not be disappointed! Colorful, whimsical, original, modern and feminine, the creations of Lily are all imprints of an exotic charm to none. 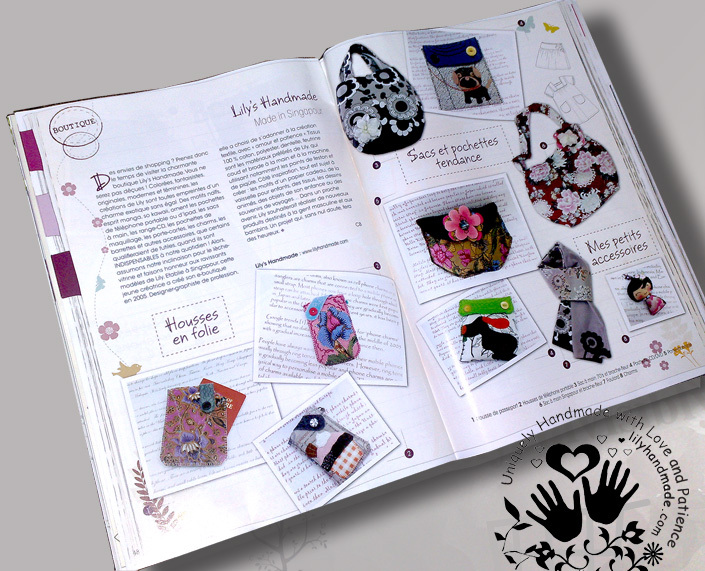 Reasons naive mind manga, so kawaii, adorn the covers of mobile phone or iPad, the handbags, the CD rack, the sleeves up, the card holder, charms, barrettes and other accessories, some would say futile when they are indispensable to our daily life. So take our inclination for shopping and do honor to the lovely models of Lily. Headquartered in Singapore, this young designer has created the e-shop in 2005. Graphic-designer by profession, she has chosen to devote herself to the creation of textle with (love and patience). 100% cotton, polyester, lace, felt are the preferred materials for Lily, who sews and embroiders by hand and machine, including using the button-hole stitches and other method of sewing. Coast inspiration, everything is about to create: the motif of a gift wrap, dishes for children, fabrics, drawings, anime, the objects of her childhood memories of trips or … In the near future, Lily would make a new products for the male and toddlers. A project that no doubt will make people happy! Why some of the buyers’ package/parcel will arrive as early as 5 working days but some as late as more than 18 working days? The above question has been asked by many customers and me, myself too. Therefore, I have decided to asked one of our local postal service provider. Each letter/parcels/packages will be processed either on the same or next working day upon receiving it from the senders (depending on the cut-off time). After which the postal service provider will consolidate into big bags and ready to air-delivery to the respective countries. The critical part is that each big bag(full of letters,parcels/packages) will rely on which route this plane is flying. If you are lucky, your package/parcel is on the plane which flying directly to your country, it will reach your place very fast. If your package/parcel is on the plane which is embarking to other country first before flying to your country, it will take a long while to reach your place. Of course, it is still depending on the custom clearance of the receiver’s country. So now! 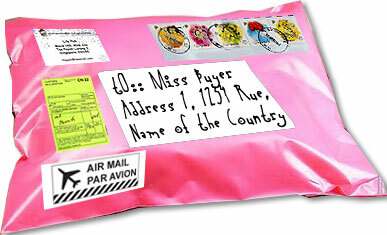 You have known the reasons of your order which sometimes reach your premises so fast and sometime so slow. I am really seek your kind understanding and patience towards your order.